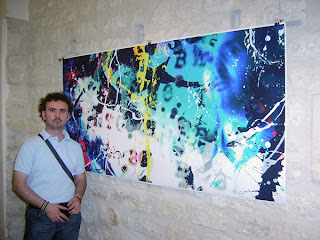 (Mimosaextra II/06) "On April 20, 2006 the abstract painter and digital artist Zoran Poposki will open his exhibition at the GALLERY twenty-four in Paris. The body of works from this Macedonian artrist combines element of mixed media and text to create a powerful exhibition. His abstract paintings and prints are present in private collections abroad, and are along side the works of such masters as Miro, Appel, and Jorn."